Americanized Democracy: Independence or Dependence? 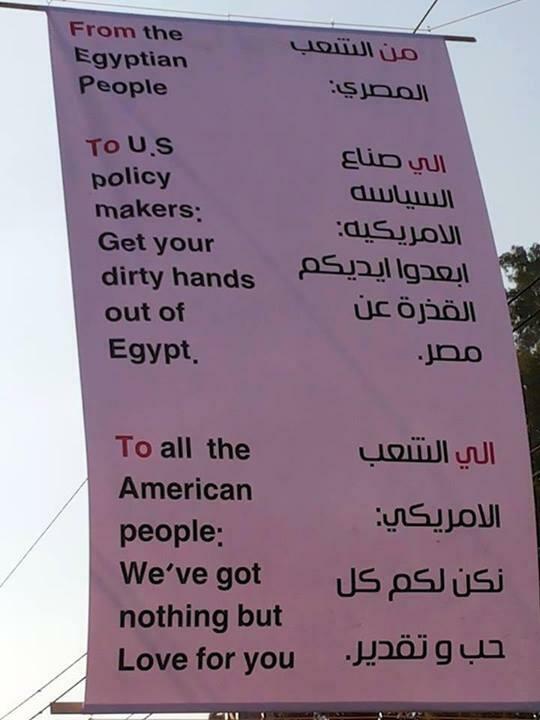 Egyptians message to Americans during military coup. On Facebook this sign is generating a lot of shock and awe from Americans. There is “Wow” and “Wow. Just Wow” and other expressions of speechless wonder. 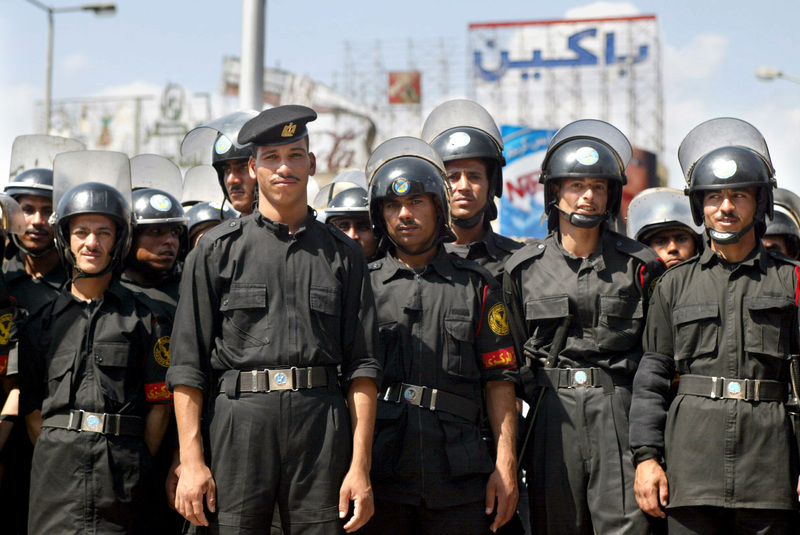 In light of Washington’s longtime backing of deposed Egyptian president Hosni Mubarak, and this week’s military coup, which keeps Egyptian “democracy” in limbo indefinitely, any show of Egyptian grace is, indeed, surprising. But I’m not shocked or awed, just grateful. I’m grateful that Egyptian wisdom, grace and insight endures. It’s not the first time I’ve witnessed their good character. About eight months after the terrorist attacks of 9/11, I was dispatched to Egypt to report a series of stories about the view of Americans from the perspective of the Arab world. My “fixer” (translator, adviser, a journalist’s all-around go-to) and I came across a massive anti-American, anti-Israeli protest in downtown Cairo. There were hundreds of protesters and twice as many riot police. It was a strange sight because then-Egyptian President Mubarak did not allow public protests in “democratic” Egypt. My fixer, a wonderful Egyptian man who’s a Facebook friend but doesn’t like to be named much less tagged, said to me, “We have to get you inside of there.” He was referring to the protest and the bullring of police. I stared at him, unconvinced. I insisted that I could see things just fine from inside his Jeep Cherokee. He was persistent, with both me and the riot police, and within minutes we were in the bullring of Egyptian protests. Hundreds of angry Egyptians were burning flags of the U.S. and Israel, and, moments earlier, President George W. Bush and Israeli Prime Minister Ariel Sharon had been burned in effigy. As soon as protesters saw an American reporter with a notepad, they’d approach and ask me to put “facts to paper.” In other words, they wanted a genuine no spin zone. (Paying attention Bill O’Reilly?) Over and over again, in similar words and phrases, one Egyptian or another would say, “We love Americans but we hate your politics.” Among the grievances, they hated the way Washington propped up Mubarak’s regime in defense of Israel, and how it facilitated the spread of Wall Street franchises (Hardee’s, Radio Shack, Subway, KFC, etc.) through the Islamic world. Maybe they loved Hollywood and Motown and Michael Jordan, but I thought it was strange for them to say they loved the U.S. electorate since Americans vote Washington politicians into office. But then I thought about Mubarak’s two-decade reign (it would last almost another decade) over a false democracy and realized that Egyptians understood American politics better than Americans did. Like Egypt’s, our democracy is not entirely genuine. It’s has never been as fake as Egypt’s was under Mubarak, but Washington politicians, to a large degree, are bought and packaged by Wall Street. The Egyptians didn’t hold us accountable for Washington because they knew we weren’t entirely accountable. I’ve told this anecdote in a lot of my talks and wondered aloud: If I were in Cairo would Egyptians still give the American electorate such an easy pass. I guess I have my answer.